When it comes to wardrobe decluttering everyone’s advice is to create 3 piles ( keep, donate/waste and maybe ) and separate all clothes. 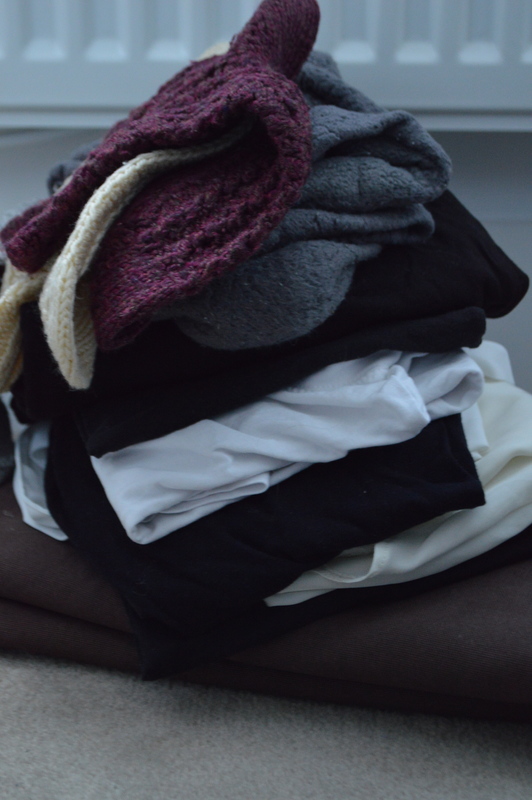 I created 3 piles but clothes included to keep, donate/waste and home clothes. I kept all the clothes that fit and what I like. 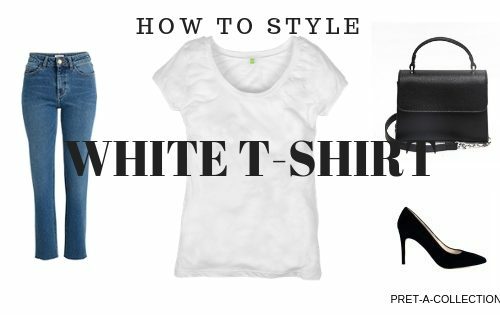 Perfect basics to create stylish outfits without morning hassle. All of them nicely hanging in the wardrobe. I implemented one item per hanger rule to keep it organized and tidy. I won’t lose a track of what I own. I donated clothes what doesn’t fit for any kind of reasons ( I outgrow that clothes or they are just too small, too colourfull … ) and waste clothes I took to the H&M to recycle. I love their recycle program. I just hope the clothes won’t go to the landfills and they will be able to do something with it. Through the year I was clearing my wardrobe a few times so this pile was quite small, but still, there was something left from last few months. I got a pile to sell. It includes all my handmade sweaters, handbag, hat and there is also coat what I forgot to include in the picture. If anyone interested of any of these pieces please let me know, I more than happy to pass it to you. In this pile I left all the clothes what is worn a lot, I love to wear it but it is not suitable for work or public show. 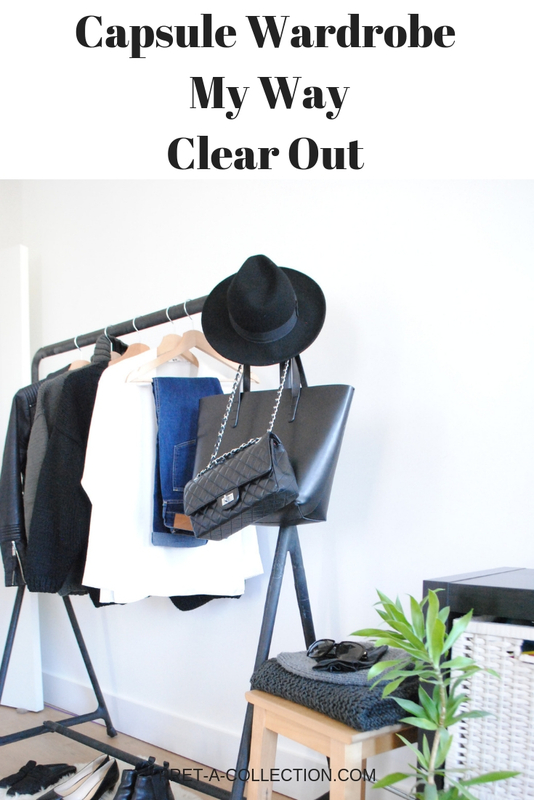 It is more clothes what I will wear when I clean house or spend the day with kids at home. But it is also clothing if I need to, I can run to the shop to get bread or milk. We all know it, we miss something and we need it so urgent but we don’t want to change only for 5 minutes. 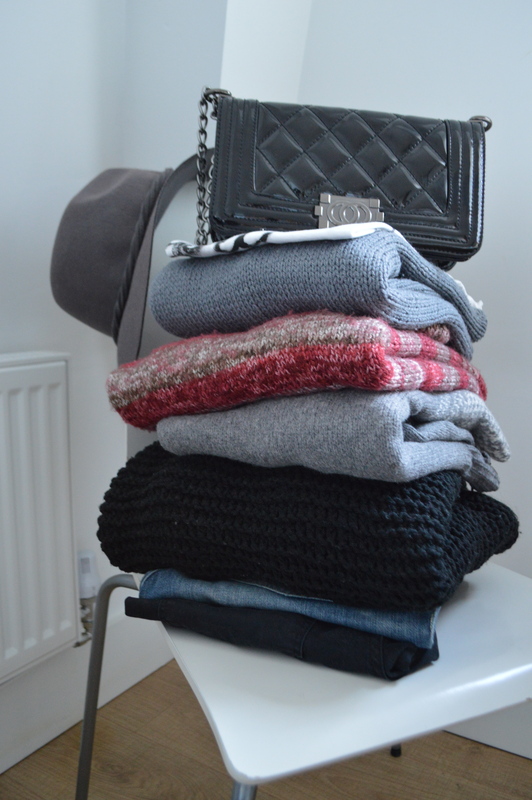 So in this pile, I kept that kind of clothes. 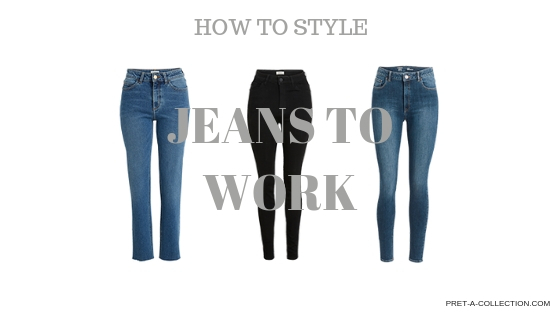 I can not call it loungewear, because we normally don’t ‘ lounge ‘ in ripped jeans or a blouse. But we can play in it. As I said at the beginning I am not going after a certain number to have in my capsule wardrobe. I was after curated wardrobe to reflect my personality and style. I didn’t want to feel not sure about my look anymore. To feel like I could look better but something is missing or something is wrong. After a year I created this wardrobe. 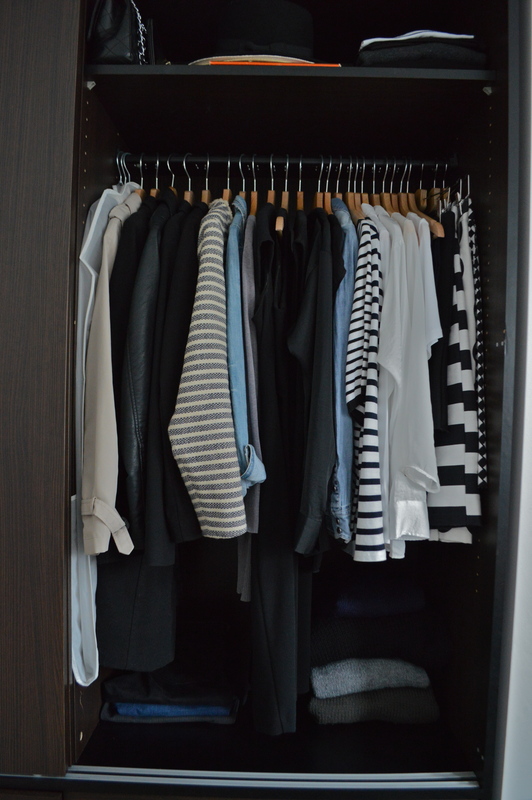 I left only most comfortable pieces and I bought only 4 items ( black jeans, cashmere sweater, white shirt and white tee ) in January what I was missing and one stripe t-shirt was gifted. Those are my basics what I wear all year round. Plus I own 5 summer dresses and 2 pairs of shorts. And only one vest top. 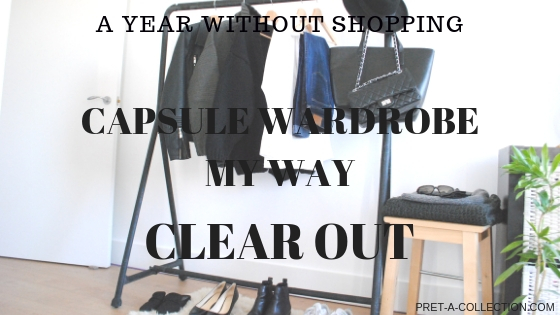 This year I would like to stick to no shopping decision, to buy as little as necessary and clear my wardrobe even more. I would like to include all year round wardrobe to my basics wardrobe. I won’t definitely buy any shoes, last year I didn’t buy any but also I didn’t bin any. Still plenty of choices to wear. I also cleared my undergarment drawer a lot. In this area, I am pretty sure I won’t need anything for while. Maybe socks but other than that I am sorted. I can say my A Year Without Shopping was a real success. I enjoyed it, created a perfect wardrobe, save some money, did something good for our planet and after all made myself proud and happy. 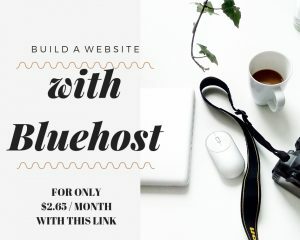 Would you join my challenge and create perfect wardrobe? 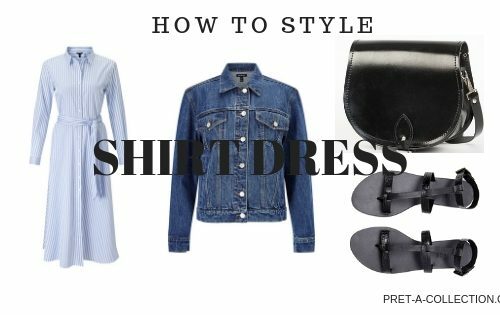 If you are not sure if you could skip shopping for that long and follow a slow process, but any way you would love to create a perfect wardrobe and look oh so stylish every single day, give me a shout, email me or comment and we can go through it together.